Two story fire the other day. Down on Griffin. Something with the electric wires sparking and overloading transformers. But really just look how close this structure is to the wires. This fire was only a matter of time. Multiple fire engines. Utility trucks. And a parking officer to make all of us use the back road to our hill. The firemen knocked it down quick style as always. 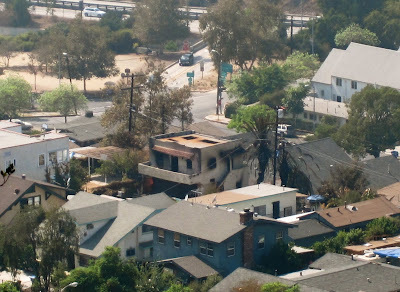 Only downfall, other than a scarred house for the owner, was that the lower third of Montecito Heights went powerless into the night. Hundred degree weather. Forget not being able to turn on a light, you had no A/C. A lot of camping in the backyard to cool off happened I bet. Was very eerie seeing entire streets pitch black. U-Roy Meets King Tubby "Cool Down Your Temper"
A Tribe Called Quest "Electric Relaxation"
Scary. I'm going to look a little more closely at all the wires hanging above our street.